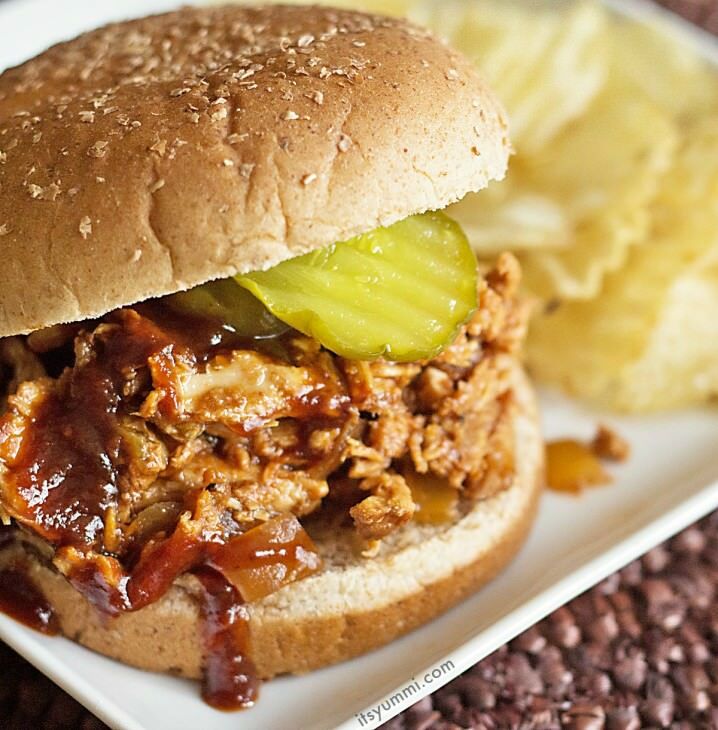 Slow cooker pulled chicken was made in my new Hamilton Beach slow cooker as part of a collaboration with the Hamilton Beach Corporation. In exchange for writing this post, I received a free slow cooker, but I received no additional compensation. All thoughts and opinions are my own. You and I both know that preparing fresh meals from scratch every day can be hard work, not to mention stressful. Especially when there are lots of family commitments keeping you busy and away from the house. Heck, some families even find it tough to schedule a time to eat meals together around the dinner table. That’s where slow cookers come into the picture, to take the stress and mess out of preparing dinner. That’s what it did for me in the case of this slow cooker pulled chicken recipe. Hamilton Beach has sparked a movement to get people back around the dinner table and to be able to enjoy all of the flavors of fall comfort foods, too. I’m pretty confident that using a slow cooker to help with the meal prep is a great way to do it. I can’t even explain how much I love my slow cooker! Truth is, I never really thought I’d get into using it as much as I have. I mean, it’s sort of bulky and and hard to find a place to store in my tiny kitchen, but now that I’ve saved so much time making easy meals with it, I don’t mind moving things around in my kitchen to make room for it. It’s like my little miracle worker! The Hamilton Beach 6-Quart Set ‘n Forget Programmable Slow Cooker has been in my apartment for the past month, and it’s been used to make some awesome meals. There are so many great features to this slow cooker! Just click here to visit the Hamilton Beach website to learn about what this model has to offer. 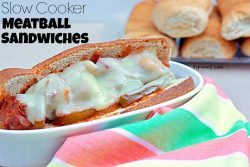 My favorite slow cooker recipes to date have been the Slow Cooker Meatball Sandwiches, Slow Cooker Italian Chicken, and Slow Cooker BBQ Sticky Rice. That is, until I made this slow cooker pulled chicken. I used the pulled chicken to put into sandwich buns. I don’t know if it’s because the I used the probe thermometer to make sure that I wasn’t overcooking my chicken, or if it was the sweet smoky combo of the sauce, but this slow cooker pulled chicken really did knock my socks off. I thought the probe thermometer might just be a fun gadget that didn’t serve much purpose. I was happily surprised to find out how accurate it really is! All I had to do was insert the probe through the hole in the lid and down into the thickest part of the chicken breast. Then I closed and clamped the lid and programmed the slow cooker to tell me when the chicken reached 163 degrees. FOOD FACT: 165 is the safe cooking temperature for poultry, but due to carryover cooking, I under cook foods by 2-3 degrees. After the timer went off, I opened the gasket sealed lid of the cooker and inserted my manual food thermometer into the same place the probe had been. Wah-lah… 163 degrees popped up. Color me impressed! I put the lid back on and cooked the chicken for another 30 minutes on high to make the chicken easier to pull apart. If I had wanted to serve BBQ chicken breasts for dinner, the buzzer would have meant that dinner was ready to serve. FYI, cooking 2 pounds of chicken breasts on high took 90 minutes. When the food reaches the proper internal temperature, the cooker switches to a “keep warm” setting. Perfect for when I have to run out of the house unexpectedly. I’m giving serious consideration to roasting a small turkey or ham in it for Thanksgiving. I totally trust it to cook my dinner to easy peasy, safe food perfection. 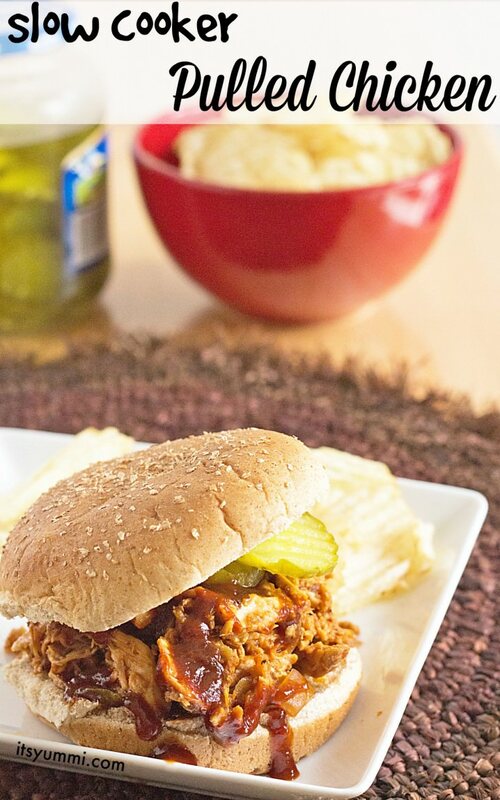 Please let me know what you think of this slow cooker pulled chicken recipe! Boneless skinless chicken breast is slow cooked with a smoky and sweet barbeque sauce until it's tender and juicy, then piled high onto whole wheat buns for an easy, healthy and delicious weeknight dinner! Place all ingredients into a medium sized saucepan over medium heat; stir to combine. Bring contents to a simmer and cook until sauce thickens and becomes darker in color, about 10-15 minutes. When refrigerated in a well covered container, the sauce will store well for up to 2 months. Place chicken breasts and diced onion into the bottom of a 6-quart slow cooker. Cover with sauce and stir to coat. Using manufacturer's instructions to operate the slow cooker, cook on high for 3--4 hours or on low for 6-7 hours. Chicken is done when meat thermometer inserted into thickest part of the breast reaches at least 163 degrees F. and chicken is starting to break apart on its own. After chicken has cooked, carefully remove breasts from cooker and transfer to a cutting board. Use two forks to pull the chicken apart and into shredded pieces. 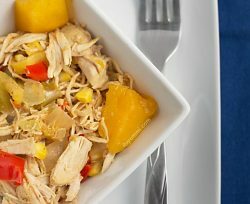 Return shredded chicken to slow cooker and stir into the BBQ sauce. Allow chicken to cook on low for another 15 minutes. Serving Suggestion Serve on buns, wrapped in flour tortillas, over rice, or on top of a garden salad. Thanks, Helen! I agree. Slow cooker recipes are fabulous any time of year, but especially when the weather is cold! Thank you – I’m just getting back into using the crockpot – and teaching my children to use it too. We’ve enjoyed pulled-pork but a variation would be greatly appreciated I’m sure. I’m putting this on our next menu! I hope that you and your children enjoy the pulled chicken recipe, Belinda! I like this recipe for pulled chicken. I am always making pulled pork instead. One quick question… if I can’t find chipotle powder, what can I use? I would like to make this next week and freeze a batch for an easy weekday meal. You’re very welcome, Simon. I hope you enjoy the recipe! This sounds good. I’m not big on chicken dishes but my husband and son love chicken. I’ll have to try making this for them. I’m glad it’s a slow cooker recipe. I hope you enjoy the recipe, Holli! Your BBQ sauce sounds delicious — at least once a week I use my slow cooker to make shredded chicken, usually for chicken tacos. Although, I think I might need a new crockpot – mine is over 10 years old and has 3 settings, low/high/off. I think I need to get one with more bells and whistles! Thanks, April! I had my last slow cooker for a very long time, and truthfully, until I tried this one from Hamilton Beach, I thought all slow cookers were alike. That is not the case! This one cooks so much more efficiently! Chicken is really healthy item. I REALLY liked this kind of recipe. I made my own spaghetti sauce and used parmesan reggiano. If I won, the first meal I’ll cook in my slow cooker is pot roast. Then I could have lots of leftovers during the week to make yummy sandwiches. I would make italian beef. I would make some yummy beef stew! I am unsure if my comment went through after I hit enter it went to another page- I would make chili as the first thing. I would make some chili, yum!! Looks Delicious! I would love to try this recipe. The first meal I would make would be chili – perfect for this time of year! The first thing I’d make is beef short ribs. This looks like a meal that the whole family would love! Thanks! 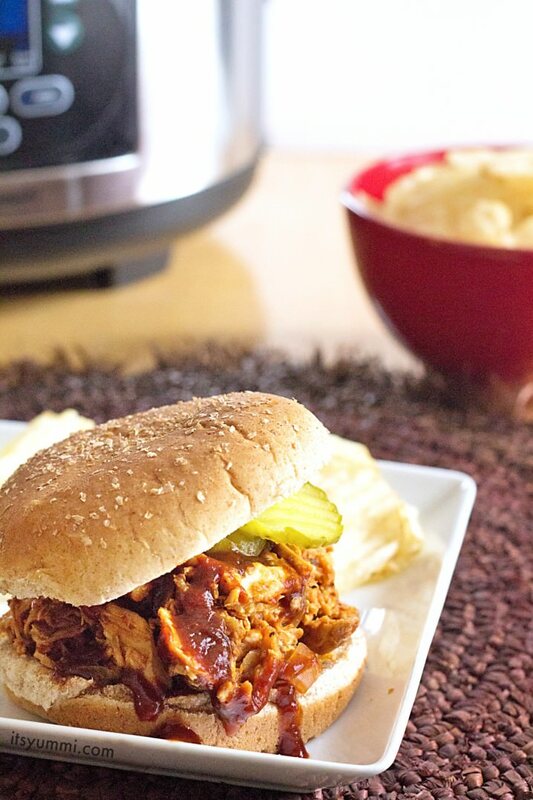 I would make my yummy pulled pork in my new slow cooker! I’d make some pork carnitas! I would make chili. Thank you for the giveaway! I think I would make some Tortilla Soup. I would make a chuck roast for shredded beef tacos. I would make this meal! I’d use it to make White Chicken Chilli! I would use it to make pulled pork! Mmmmm….my favorite! The first meal I would make my family would be my pinto beans. I’ll make slow cooker lemon chicken. Our first meal would be Italian Chicken! I LOVE the slow cooker! Gotta check out that post of yours for the slow cooker meatballs. First thing would be the recipe that you shared for the SLOW COOKER PULLED CHICKEN RECIPE because WOW does that look good. You’re singing my tune, Paula! 🙂 Slow cookers rock my world! First meal would actually be homemade applesauce…why because it is fall and there are TONS of apples! Thank you for the chance to win this giveaway. My first meal would be Crockpot Lasagna Soup. I found a recipe for some and I’ve been fit and tied to try it every since. That sounds like an amazing dish to create in a slow cooker, Terri! Good luck in the giveaway! I would make a whole roast chicken with lemon and paprika. I love making roasts in a slow cooker, Jeff. They turn out so moist and juicy! I would make spiced pumpkin oatmeal. I would make black eyed peas with smoked neckbones. That was one of my momma’s favorite dishes on New Year’s Day, Tonya! I would make taco soup first. I was thinking Pulled pork, but this Pulled Chicken looks pretty yummy too! I don’t know. I’d have to peruse some cookbooks to get inspired! I don’t currently have a slow-cooker! I’ve been wanting to upgrade my slow cooker for a long time. This one is perfect. I would love to make some hot wings!!! Hot wings in a slow cooker?! That sounds like an amazing recipe, Saundra! This looks SOOO GOOD! We are huge crock pot fans – roasts, BBQ, ribs, stews, chilis… I use it for everything. Making the roast for Cuban sandwiches is something I haven’t made in awhile and would love to make in this awesome crock pot! Oooo, now I’m craving a Cuban sandwich. Yum! I’ve been flirting with the idea of getting a slow cooker, in fact even posted in Facebook about it… anyway, fingers crossed! Nice post and slow cooker Becca! The first meal I would make if I won this slow cooker would be a loaded baked potato soup. Yummy! I love Pot Roast cooked in a slow cooker. I haven’t made a pot roast in a slow cooker yet, Wendy, but that sounds like a perfect fall dinner! Entirely scrumptious! Putting it on my menu this week! What a fancy slow cooker! I love how it moniters the temp of the meat! Love pulled chicken and your sandwiches are screaming my name! Serena, I honestly didn’t think the meat probe would be something I’d use, but I absolutely love it! I hope you have a chance to try the pulled chicken recipe some time. It really was a great dinner! I would love to make corned beef and cabbage. I am a huge fan of slow cookers in general and barbecue sauced chicken in particular. How delicious this looks, Becca! I showed my husband this. I think it’s earned a place in tomorrow’s menu. I can not wait. So happy to hear that! I hope you both enjoy it! 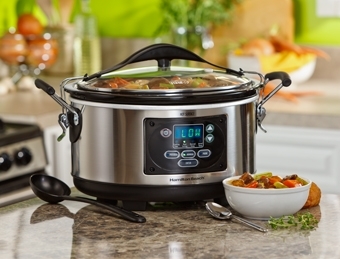 I would Love a nice big slow cooker like this the one I have is small but I use it a lot. I would have to try this pulled chicken. You did an amazing job on yours from the looks of the pictures. I hope you have a chance to try this pulled chicken recipe, Lori. It’s SO moist and full of flavor! I would try the pulled chicken or maybe pulled pork. I’m a chili lover too, Ashley! Be sure to check out my recipe index for lots of chili variations. I think I have 5 different chili recipes up there now. I would make my pot roast with potatoes and carrots and celery. We love pot roast here. then I’d make this pulled chicken recipe. If I would i would cook a great roast and potatoes with carrots celery and onions in it! I would make potato soup!! Love this easy, tasty recipe, Becca! Now this looks delish!!! And I love the slow cooker year round! Thanks, Crystal! I’m with you…I love using my slow cooker all year long! I would make a beef stew, which would be especially good as the weather is getting cooler. I’d probably make chili first. Perfect season for it! It’s absolutely the perfect season for chili, Bernadette. In a slow cooker is the ultra easy way to do it, too! The first meal I’d make if I won would be Tavern Style Pot Roast. That pot roast sounds delicious, Rosey! Good luck in the giveaway! The Pulled Chicken recipe was a great success. My son asked to put it into the rotation. I followed the recipe exactly and it was perfect. I’m so very happy to hear that it was enjoyed, Olga. Thank you so much for letting me know! Yes to chicken recipes! Beef and pork are so expensive right now. Chef Bec! This sandwich looks delicious…like it needs to jump off my computer screen and into my lap right this very instant. In fact, could you just make 2 of them jump into my lap? I’ll need a 2nd one since the 1st will be gone in a matter of seconds. What you believe that I actually don’t own a slow cooker? Yup, ours broke last year…and I haven’t replaced it. But if you keep posting deliciousness like this, you may make me have to go get a new one! My first would be overnight apple cinnamon oatmeal, my kids love it. Your chicken recipe sounds great. I made oatmeal in my crock pot before. I could always use another crock pot too. Hi Becca- Would you believe that off all the ingredients, I did not have ketchup? Ran out got some and it is now in my old slow cooker. Smells divine already. 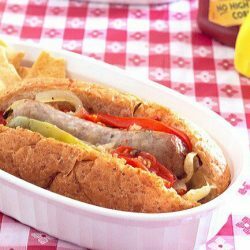 I just found your site this week and this is my 2nd recipe. I tried your vegetarian minestrone soup. Even my picky one, loved it. Thank you for all the work that you put into this. It is greatly appreciated. BTW, i did make dairy free chocolate manicotti and topped them with chocolate coconut sauce – plates were licked that night in my house! I like to make soups and stews in my slowcooker, so I would make taco soup or beef stew. both sound good to me, Laura! Wow Becca, this sounds delicious. Going to try it, on a stove top though. I don’t have a slow cooker. Mi know, hey, I’m from NY remember! Hahaha. I’d love to try this recipe for pulled chicken! I would make chicken tacos first – they are so easy, and always a huge hit in our house! Chicken tacos sounds like an awesome slow cooker dinner, Tammi! First thing i’d make would be slow cooker Lasagna! Oh, yum, Wendy! Slow cookers are just the best! Woohoo, Deb! I was hoping that there would be someone in the market for an extra special slow cooker like this one. Good luck… and I definitely need your chili recipe in my life! The first thing would be sweet and sour meatballs. I love making those in my slow cooker too, D! I would make seafood chowder with shrimp and crabmeat. It is so creamy and rich. Seafood chowder sounds like a fantastic meal for the slow cooker, Natalie!